The very first place we visited on our southern trip was the Booth Western Art Museum in Cartersville, Georgia. That’s just north of Atlanta. Our friends Susan and Shelton took us there. “We know you’ll love it,” they said. It was, ostensibly, an art museum. But there were a lot of history connections to be made there. I don’t have a whole lot to say about the visit, but I did want to show you some of the objects and say that, if you’re in the area and are interested in the American west, this is a must-do. 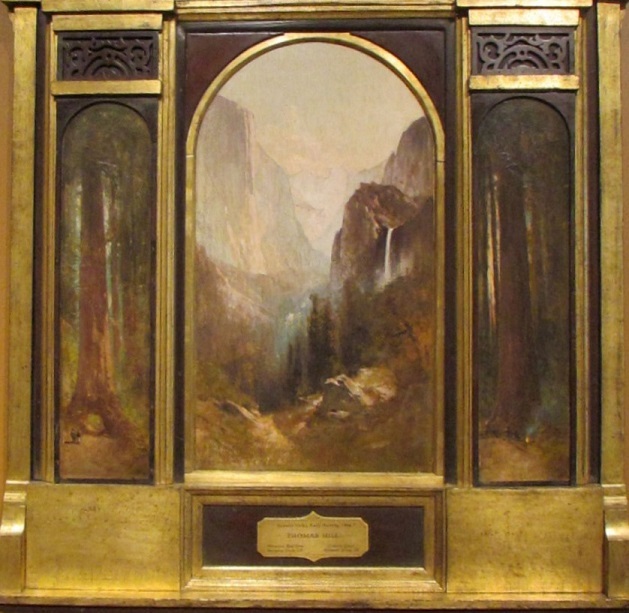 An 1894 oil on canvas triptych of Yosemite by Thomas Byron Hill. It’s a shame that you can’t tell how stunning this painting was, from the photo. 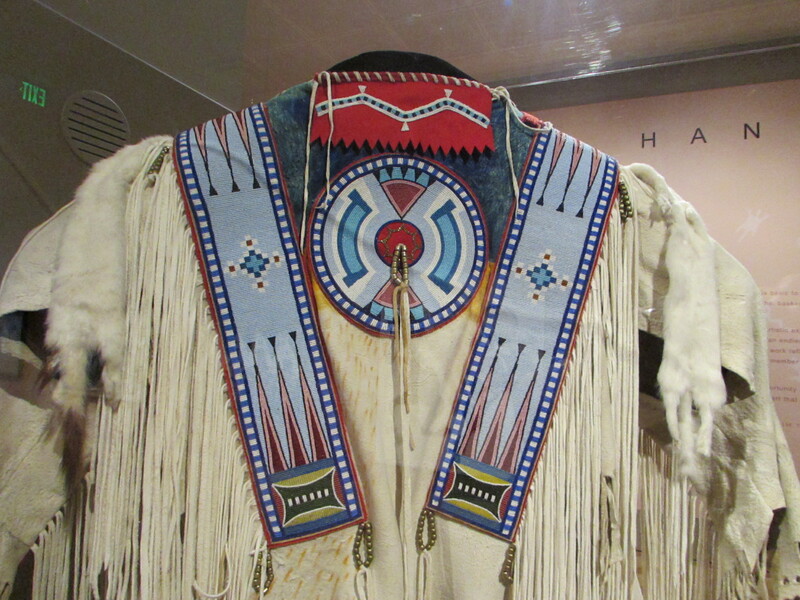 An 1890 Nez Perce buckskin dress with beaded yoke. Again, the photo doesn’t do justice to the absolutely amazing beadwork. 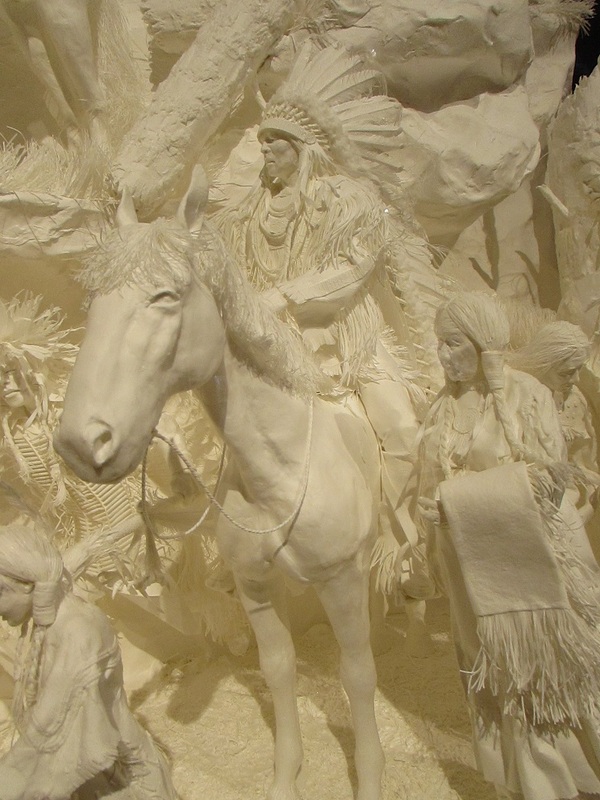 That is a sculpture made out of paper by Patty and Allen Eckman, called Prairie Edge Powwow (2001). It was insane. The description says that it’s one of a series that tells the story of a Plains Indian family. In this scene, they’re attending a dance ceremony in the Black Hills. There were lots of sculptures and paintings of cowboys. 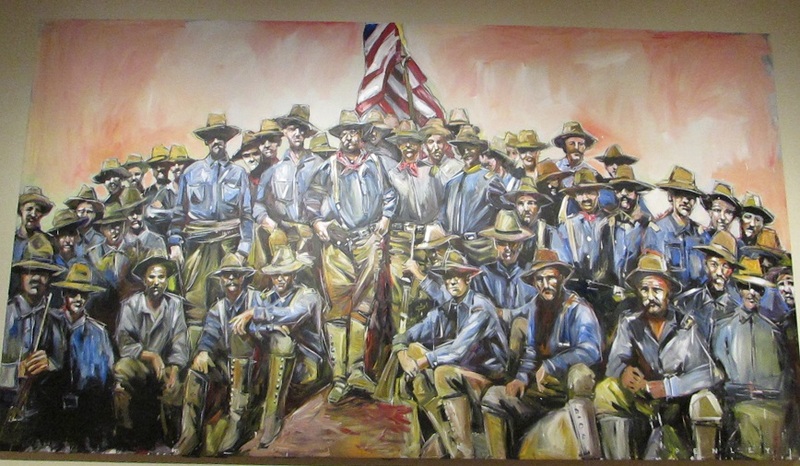 This modern rendering of Teddy Roosevelt and the Rough Riders (Steve Penley, 2000) was one of my favorites. And the museum’s piece de resistance for a History Tourist: they have (and display) a letter from every single President of the United States. The letters weren’t necessarily written when they were president. 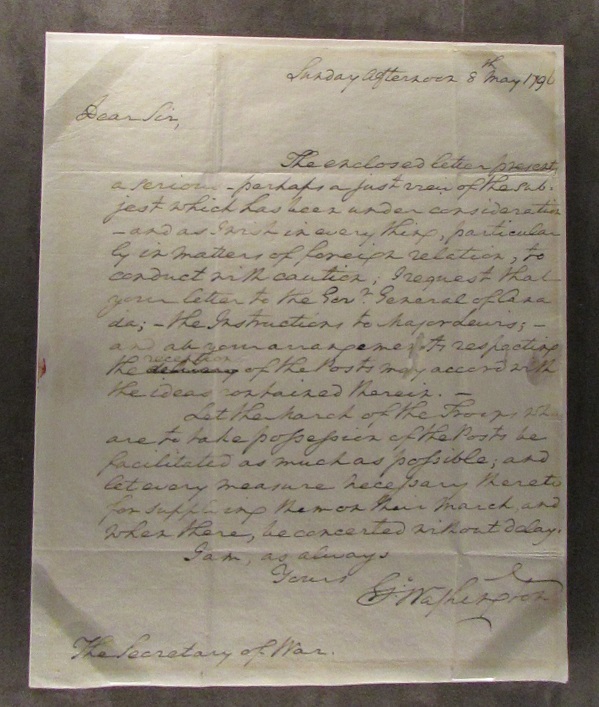 George Washington, for example, signs himself the Secretary of War in this May 8, 1796 letter. It’s about supplying troops on their march to Canada. So with this George Washington item, I’m ending my series about our September trip through the southeastern US. We had a wonderful time — amazing food, lovely people, and great historic sites. And there was so much that we didn’t see that we’re already talking about a return visit. That paper sculpture is remarkable. I’ve never seen anything like it. Love the Yosemite painting! 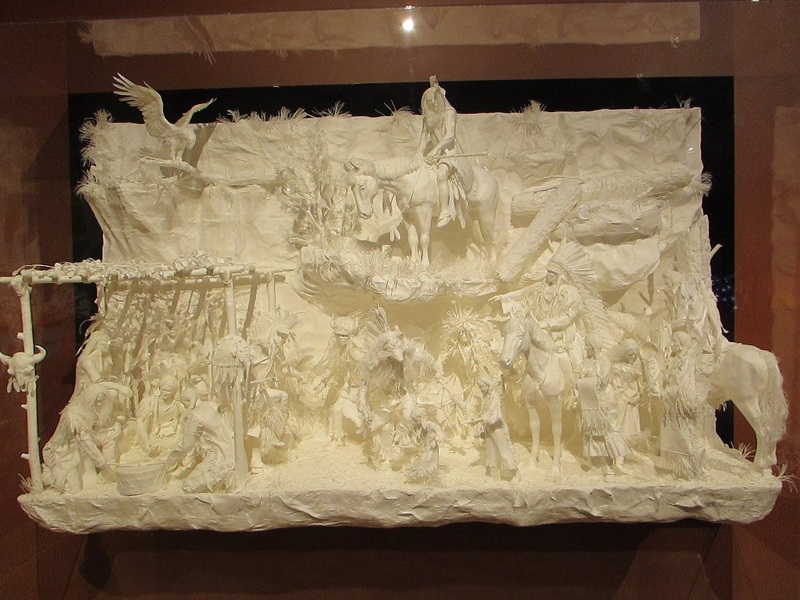 The paper sculpture absolutely blew me away – its the one piece that I’ll remember the most. And that in a museum with hundreds of pretty spectacular items. I have a thing for western national parks, so the Yosemite painting caught my eye. I’ve never been there but I’m hoping to remedy that in the next year or two. It really was. Lots of Remington type statues and western movie posters, but lots of things I’d never seen as well. Never been a fan of the Remington statues, though I know they have quite a following. So dark. But that paper sculpture was a revelation! Beautiful and so amazingly detailed! I was just blown away by the paper sculpture. As you say, I just couldn’t believe the detail.